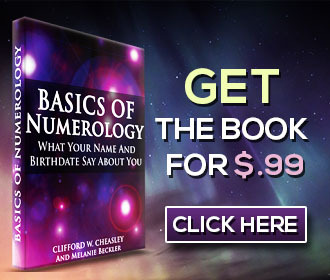 Numerology Basics - Learn The Basics Of Numerology Free, Today! Welcome to The Basics of Numerology. In 2014, Author and Spiritual Teacher, Melanie Beckler revised and updated an old Numerology book to help infuse it with modern understanding of an ancient tradition. After months of following, learning, reading and practicing numerology basics, she decided it was time to share what she had learned through this book. This book is currently being offered for free, for a limited time and will teach you what you need to understand what your birth date and your birth name say about you. After the introduction to numerology, you understand how to calculate your ‘Soul Urge' number, your ‘Appearance' number and your ‘Expression' number. Your ‘soul urge' is your inner nature or essentially the lens thorough which you view the world. Your ‘appearance' is just that… Your physical appearance and your personality. Your ‘expression' is how you respond to the people, events and experiences you encounter in your life. Understanding these aspects about yourself through Numerology will help you along your personal path of spiritual growth and personal development. The book makes this simple. Once you know your specific numbers, or the numbers of others, you simply go to that corresponding number in the book and read the meanings or interpretations of those individual numbers. All interpretations were written by a master of Numerology and their insights are truly timeless. Being able to calculate the numerology of others can help you understand more about compatibility with specific people, how to best work with others and how to most effectively communicate with those who are closest to you in your life. Learning how to read numerology and how to calculate numerology is not only fun and enlightening, but it can also be a useful tool that you can use for the rest of your life. This book, The Basics Of Numerology will give you everything you need to begin calculating your numerology chart and the numerology of others in minutes!